In a sleepy, snow-covered city, Cora Crowder is busy preparing for the holiday season. Searching for a perfect gift, a fortuitous trip to Warner, Werner, and Wizbotterdad’s (a most unusual bookshop) leads to an unexpected encounter with co-worker Simon Derrick. And the surprise discovery of a ticket for a truly one-of-a-kind Christmas Ball. 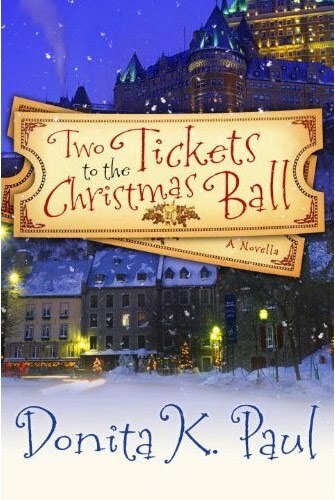 Every year, the matchmaking booksellers of the Sage Street bookshop host an enchanting, old-fashioned Christmas Ball for the romantic matches they’ve decided to bring together. This year, will Simon and Cora discover a perfect chemistry in their opposite personalities and shared faith? Or will the matchmakers’ best laid plans end up ruining everything this holiday? I've only ever read fantasy books by Donita K. Paul, and she's one of my favorite authors. This book was another hit for me. It was a sweet romance that was perfect for this time of year. The thing I love most about this author's books are that they are just so cozy. They're just right for reading while cuddling under a blanket with a cup of tea or cocoa. Two Tickets to the Christmas Ball wasn't very fast paced. It seemed to cover a very short amount of time, and honestly not a lot happened. I really would have liked to see the story a bit more fleshed out and more things explained. It was pretty short, and had a bit of an abrupt ending. We never really got to know exactly what was going on or why or how. That being said, I think that it was meant to be a quick holiday read, not a long detailed story. I quite liked the characters here, and would love to read more about them. I didn't want to the story to end. There is definitely a Christian message in the book, and religion is sprinkled throughout. Pretty much what you'd expect from a Christian publisher and author. All in all, I would definitely recommend this if you're looking for a sweet holiday read that you can squeeze in between all your busy times. This is an author that I'll continue to read. You're right, Brenda. Two Tickets was written as a quick read to be enjoyed one evening by the fireplace with a cup of cocoa at hand. I left a lot for the reader to speculate on with a purpose in mind. Sometimes the books we choose to mull over are the ones that leave something to the imagination. Felicia, ask the stupid library to purchase one. Our library is very open to patron requests. Or use interlibrary loan. You might be reading the Christmas book for Valentine's day. Felicia, you're more than welcome to borrow my copy. Donita, thanks for stopping by my blog. As always, I really love your books! I saw this at the bookstore and thought it sounded good. I like quick, cozy reads for the Holidays. Thanks. Really interesting review, thanks a lot and it seems the books worth a read! ALE & BLOOD: A Bring Down Heaven Novella!